An Imagination Library is a gift from a community to its children. In 1995, she started the Imagination Library in her home state of Tennessee. 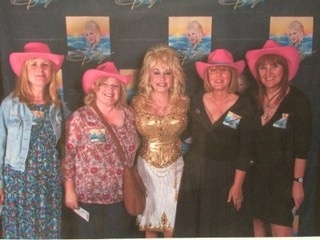 Dolly personally pays for all the children in Sevier County to receive a book each month. The inspiration was Dolly’s father, Robert Lee Parton, who, as a child, never had the opportunity to learn to read or write. She always wondered what her father could have become if he had had the opportunity of an education. This made her determined to ensure that all the children in Sevier could develop a love of reading. The Dollywood Foundation provides the infrastructure for books to be purchased, and for the worldwide distribution network. Local community champions establish the libraries and raise funds for the purchase and postage of the books. It costs £25 per year, for each child, registered in the library, to receive 12 books, addressed to them, at their home. There are currently 3 Imagination Libraries in Greater Manchester. Salford, Starting Life Well service started the first Imagination Library for all Looked After Children, from birth to 5 years, in Salford. In addition, Salford currently has one school registering children for an Imagination Library. This is for children living in the Duchy Estate, who either attend Summerville Primary School, M6 7HB, or who have older siblings attending the school. It currently provides books for up to 90 members of the library. A second Imagination Library will be opening in autumn 2017 at Lark Hill Community Primary School, M5 4BJ. This library is for children who either, attend Lark Hill School, or have older siblings who attend the school. More than 170 children will be eligible to register with this library. 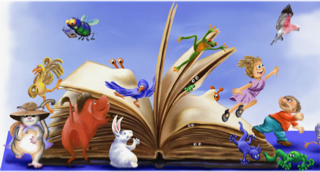 At Summerville School, with money donated by Worsley Rotary Dragons' Den, Salford Imagination Library have run two Storytellers courses for parents and carers, who want to make their storytelling fascinating and interesting. · “I’m more descriptive and I find it easier to ask open questions. confident in expressing his thoughts and feelings about the book. Lark Hill Community Volunteers to become Storyteller Coaches. The Lark Hill Storyteller Coaches will then be able to offer the same course parents received at Summerville School. Dolly Parton, like Albert Einstein, believes imagination will help you fulfil your potential, and she knows that books provide inspiration for that imagination. 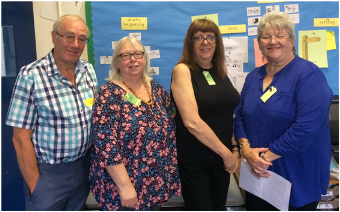 The Salford Imagination Library Champion is Audrey Othick, a Worsley Rotarian, who, along with a group of dedicated and inspirational volunteers, raises money, awareness and delivers the Storyteller courses.